Zong to give 10% discount on buying Zong Fiber Home MBB device. On booking online Zong will give you 10% discount on device price and you can collect your booked device from any Zong CSC . For booking, you need to fill out the form at Zong website in order to get your Fiber Home MBB device. 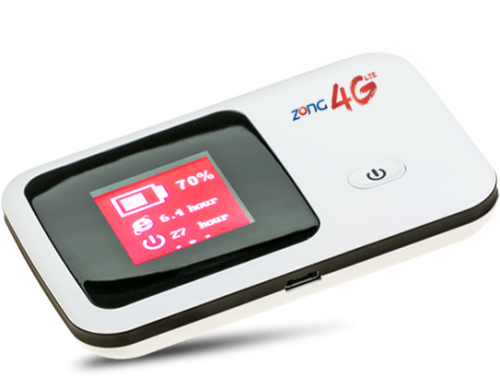 Zong Fiber Home is LM53SL 4G Mobile WIFI, Mifi Device which Support LTE FDD/WCDMA/GSM network and packed with 2100 mAh battery which give 8 hours of usage with Maximum standby time of 40 hours. Free Home Delivery & free activation at your door step. @zongptcl:disqus bro, zong new mifi device unlocking possible or not? It hurts when I see a duplicate content. I mean for what you guys are posting the content when you are up for copying and pasting? yes, how can we change that? can we write our own specs? can we make our own packages? everything can’t be changed and this topic covers all relevant info which you can get by visiting 2,3 link of zong official site.